Hi y'all, time to put something up again. 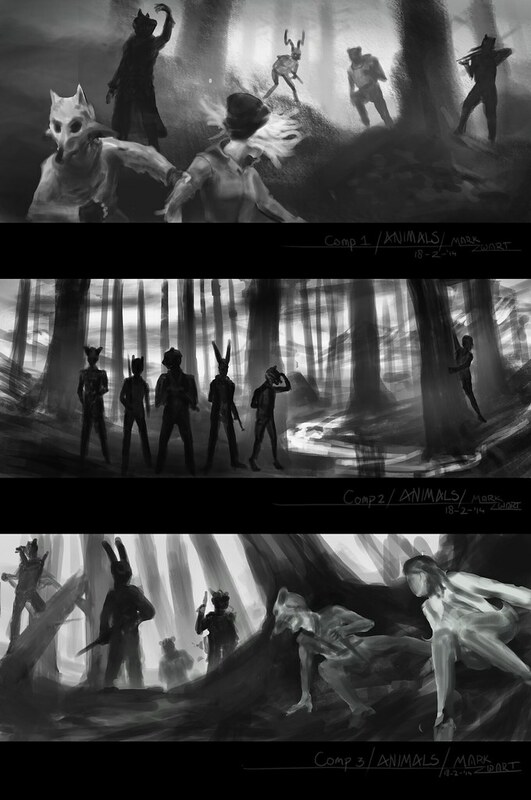 This is a piece of concept art that I recently did for an upcoming movie called Animals by the awesome Ryan Braund. The movie is about 5 teens with animal masks who are hiding in the pine woods of alaska, where they kill people that come too close to their hideout to stay hidden. When a 14 year old girl comes by, one of the boys decides to run away with the girl. My task was to visualize the environment and the kids in one image to get people excited. Ryan originally wanted to have all kids standing next to eachother (like thumbnail #2 below), but I thought it would be interesting to have a more dynamic composition, so I showed him the thumbnails below. Luckily he liked it, so I finished thumb #3. I had a lot of fun working on this, so big up to Ryan for giving the opportunity.